These are pêche plat, or ‘flat peaches’…for obvious reasons! They’re white-fleshed little peaches with tiny pits and are grown in the US as well, where they’re often called Donut® or Saturn peaches. Last week in Paris I saw flat nectarines. Is this a trend? What’s next…flat watermelons? Flat blueberries? These are the best fruit in the world: Reine Claude plums. Don’t let the dull green skin fool you; these are the sweetest fruits to be found. 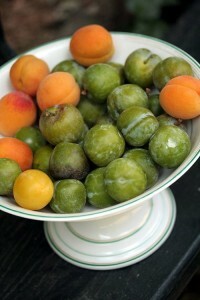 There’s similar green plums in France, but le vrai Reine Claude plums are only grown in Moissac, a town close to Toulouse. I eat them by the bagful, like candy, during their brief but productive in season. Fresh hazelnuts, still on their pods. I pick them right off the trees and crack them open. Last year I did a dinner with San Francisco chef Traci des Jardins, who shaved slices the soft, almost-crisp nuts over a delicous Celery Root Soup, which made our guests swoon. No wonder she beat the shorts off that Italian chef from New York. 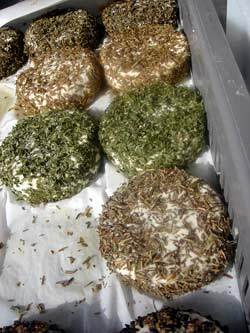 At the market in the Norman village of Louviers, I found these lovely rounds of chèvre. I bought three…but left them behind in someone’s refrigerator so I never got to taste them! Loaves of country bread at the market. 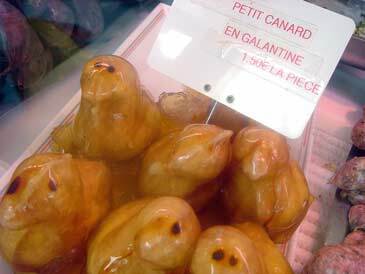 Are these the French version of Peeps? My main reason for heading to Normandy this weekend was to celebrate Susan’s birthday and we invited some of her best friends. We spent the evening grilling corn on the cob and travers du porc (pork ribs) that I bought at Tang Frères in Paris’ Chinatown. We finished the evening with a sky-high Devils Food Cake that I made along with Homemade Malted Milk Ice cream. Très americain…but our French friends lapped it up it as fast as us Americans! 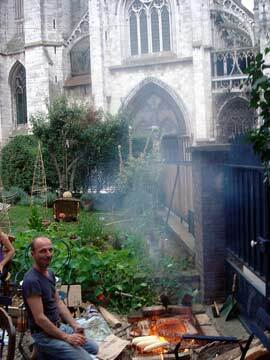 The ornate Gothic church directly across from her home provided a dramatic backdrop as the summer sun went down. The Reine Claude Plums Have Arrived! Be careful of those fresh hazelnuts! I spent a long summer as an exchange student in Turkey when I was 17- mostly on the family’s hazelnut farm on the Black Sea, the only English speaker for as far as I could find. During the Perseus meteor showers in August, I lay out all night on the lawn amidst the piles of freshly harvested hazelnuts – the most amazing meteor showers of my life, out there in the deep blackness with the expanse of the sea to give a great view – snacking on these fresh hazelnuts all the while. The next day began a week of sickness – my host family immediately guessed the cause – my pounds of eating gone almost overnight. Any chance of posting that Malted Milk Ice Cream recipe? That sounds fantastic! Sounds like Susan had a nice birthday celebration with good friends. Very nice. I’d love to have a taste of everything you’ve mentioned above! What a life!!! I could spew envy all over, but I’ll refrain in lieu of a question, or three. Did you eat one of those duck jello peeps? What was in the middle? Is duck jello as delicious as gooseberry? 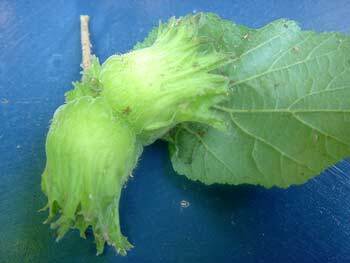 i didn’t even know young hazelnuts were ok to eat (well in small amounts, plentyo!) we are surrounded by hazelnut trees and i love them. also a related/unrelated sidebar: our house is named ‘noisette’ mostly b/c we are a little nutty; we didn’t even know there were that many hazelnut trees around us when we moved in in the winter. Hi David, your picture of the Reine Claude plums is so vivid, I can almost smell and even taste them! 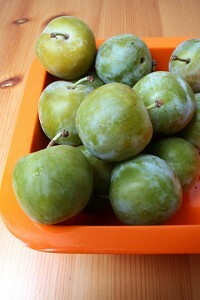 When I was in San SebastiÃ¡n, Spain, last month I had similar green plums. They called them Claudia plums. They were the sweetest, most delicious plums I’ve ever had, better even than my favorite local (to the San Francisco Bay Area) Santa Rosa plums or Flavor King pluots. I ate them every day while I was there. 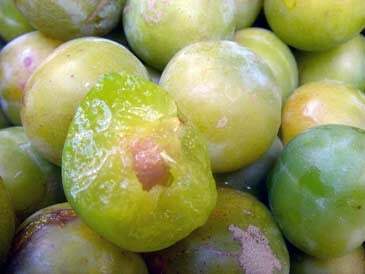 I know fruit expert David Karp calls the Reine Claude, or greengage, plums his favorite fruit in the world, so I imagine they are that much better even than the Claudia. What do think about the Donut peach, though? The few I’ve tried have been flavorless, which is sad because white peaches and nectarines can be so satisfying. In fact, my favorite local fruit is the Artic Rose nectarine grown by Kashiwase, a fruit you must remember from your time at Chez Panisse. Thanks David! After reading your journal I was completely amazed to find the Claude Reine plums you mentioned in our supermarket here in Holland. I bought a kilo yesterday and, needless to say, there are now none left! They really are like sweeties rather than fruit – a wonderful flavour! I also found some white fleshed nectarines the other day which were a revelation. Yum! Nicky: The peaches are good! They taste like fine white peaches, although you do get a bit less ‘bang-for-the-buck’ like the larger (and less-expensive) ones. But they are really fun and pretty and I can’t resist buying them once in a while. Emi and Brett: I didn’t realize they were ‘registered’ either! 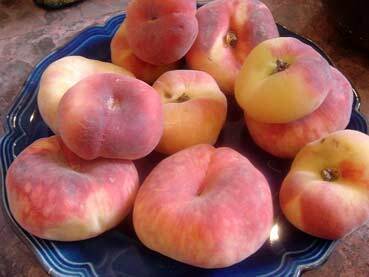 We used to serve them at Chez Panisse, and they were called ‘Pintu’ peaches. 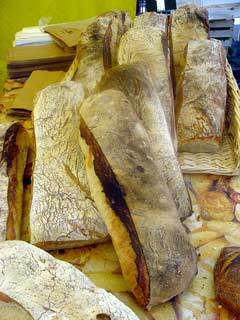 Farmgirl: Yes, you can find good bread in France. You just need to look past all the flimsy, pale baguettes. I love reading your blog and look at your photo’s. 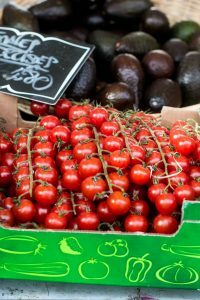 A few days ago I saw your ‘pÃªche plat’ at a great green-grocery in Amsterdam, where I do work. Of course, I had to buy them immediately. I must say: they’re delicious, less sweet than the usual ones. Found some of the plums in Lille this past weekend. They were quite extraordinary–I’m only sorry I did not bring more back with me. Hoping to find some at the market (Borough).